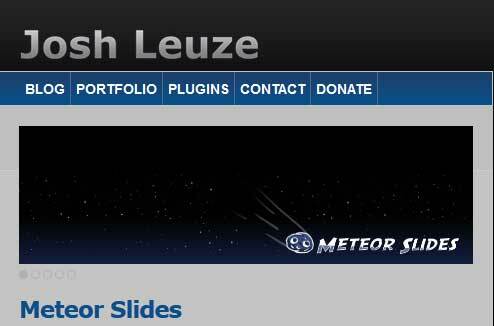 Meteor Slides for WordPress isa great and useful plugin with a LOT of options to create the perfect responsive slider / slideshow for your website! I ran across this particular WordPress plugin searching for a simple slideshow plugin that was responsive to go along with the responsive websites that we have been focusing on for the last few months. Most slideshows are really geared to a fixed size and that doesn’t do squat when you’re using a responsive design. I found Meteor Slides to be easy to configure, and generally pretty easy to use – and you can get all sorts of fancy with some of the provided shortcodes! The settings are the first thing to work with. Right off the bat, you only have one set of general settings – whatever the LARGEST size you want to use for any slideshow, THAT is what you want to set up in your general settings. So if you are going to do an 800×600 and a 400×300 elsewhere in your site or pages, set the sizing to reflect the 800×600. You can modify your secondary slideshows with parameters later when you use them. Go ahead and create the slideshows that you’re planning on using, at least 1 to get you going. As you add slides, you will just click on that slideshow to add your new slides to it. In my case, while I’m writing this, I have about 20 slideshows that I’m creating and now we’re adding in images en masse! Click on the “Add New” option, fill in the slide name as desired – you could probably optimize your title for SEO purposes. For me at the moment, I’m doing huge amounts and am just NOT going to take the time to do all that though. Next, click the “Set featured image” hyperlink. This will bring up the WordPress drag and drop interface. Just drag your image into the upload area (or use the select your picture option) and then modify the file information as desired. The important thing to do here is to click the “Use as featured image” – you do NOT need to worry about the insert into post options. Click the top right X to close the window. Select your slideshow to the right – you can select more than one slideshow if desired. You can also add in a link to use from the particular slide if desired. It’s not required though that you link anything – you can just have a nice responsive slideshow if that’s all you want. For full documentation on Meteor Slides – visit the author homepage at http://www.jleuze.com/plugins/meteor-slides/.